The pick and roll is my favorite play in basketball – bar none. It’s combination of possibilities in the two-man game, combined with some good off-ball movement is close to unguardable. But if a defense gets a chance to load up and run the coverage of their choice, it’s to make things more difficult for you than they need to be. Making good reads out of the pick and roll is the players responsibility, but it’ your job as a coach to make it as easy as possible for them. When you want your best three point shooter to take a three point shot, you set them up to come up off off-ball screens, and keep the defense occupied with other movement – and you should look at setting your pick and roll the same way. forward into a pick and roll. 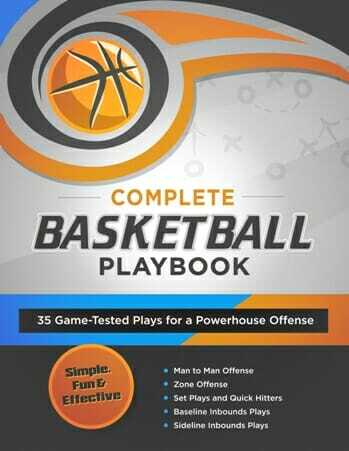 Start in the High Post offense formation, with your two guards up top, your two forwards down low in the russian corners, and your center on the middle of the free-throw line. Have your point guard dribble over to the right wing. 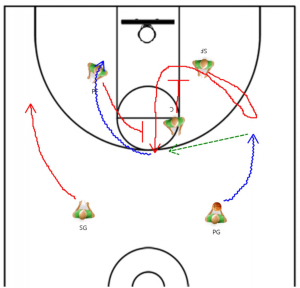 As they drive over, have the small forward fake like they are coming up to the same wing for a hand-off, and then back cut underneath the hoop. 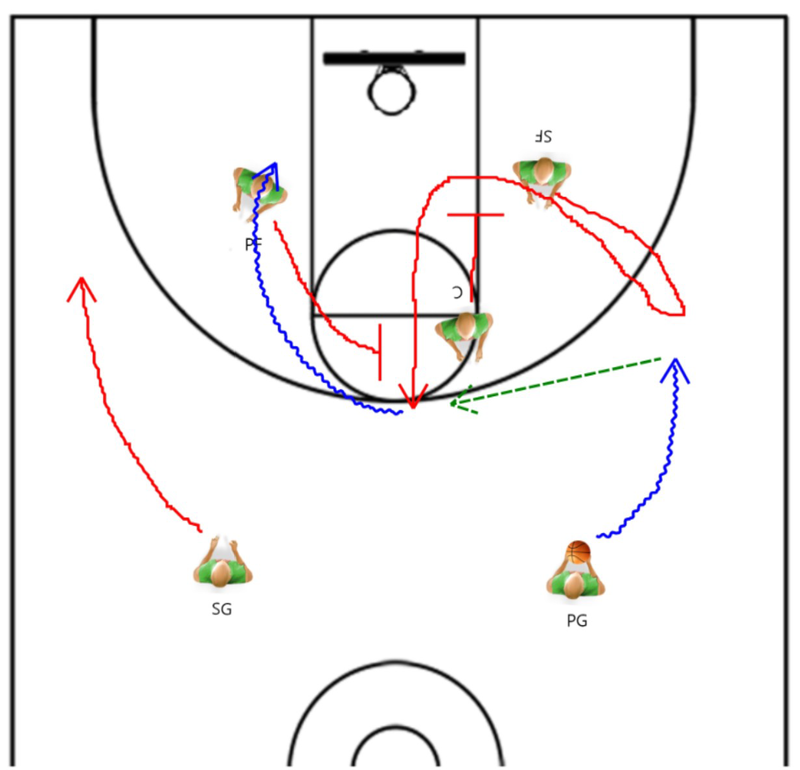 The center will sprint down to the hoop, setting a downscreen on the small forward’s man. As the small forward comes up through to the top of the key to receive the pass, the off guard will slide along the three point line, spacing out to the wing. 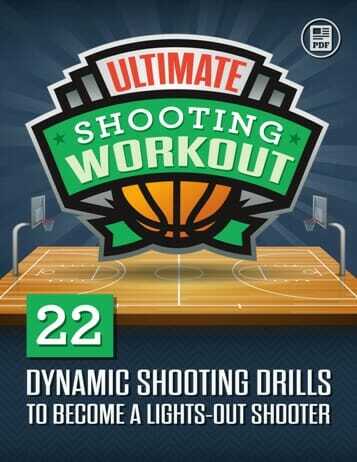 Your power forward is going to sprint up to the top of the key, and set a pick on the small forward’s man. This final pick and roll is the play we’ve been looking for the whole time. You can either have the power forward roll to the basket after the pick and have the center fill in back up to the free throw line, or have them both stay put, depending on the strength’s and weaknesses of your big men. That’s it for the Guard Dribble Up. 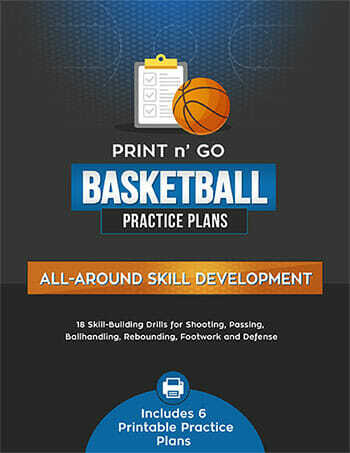 For some more pick and roll tips, check out these pick and roll drills!